The Power of Enthusiasm: Should You Create a “Street Team”? Remember that time when you created something, and all of these strangers magically found it and just shouted about it to everyone they knew, and you went “viral,” and your success just grew and grew, like a runaway snowball cruising down a hill? Recently, I have heard some successful authors such as Bella Andre and Barbara Freethy use this term: “street team.” Sounds cool, right? Well, today, let’s talk about what a street team is, and why it can be important to FINALLY building some momentum in helping to spread the word about whatever it is you are creating. What immediately moved me about this was the admission that she couldn’t imagine who would support her, and how surprised she was to be proven wrong. At the time, her Street Team had a 9 members – more than enough to thrill Johanna. And now as I write this, she has 15 folks who joined. I think that all too often, a number such as “9” sounds small, like a failure. But imagine this: NINE people showed up who actively want to support your work. Amazing, right? And then within a few days, she had a 60% growth rate to 15 people! 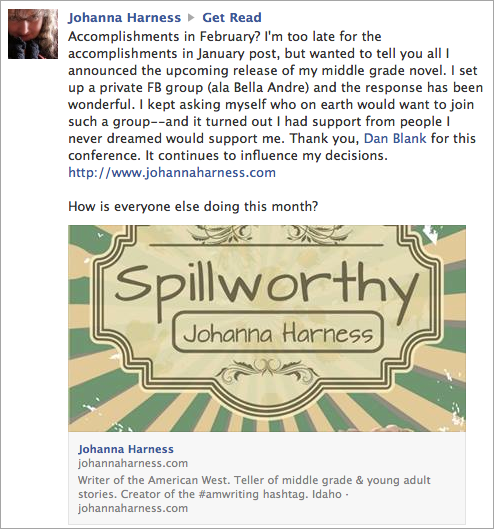 Shelli shared a great series of links from various folks talking about what street teams are, well worth checking out. Access to exclusive content such as character dossiers, character diaries, and more. She said she had 30 folks sign up right away, and the street team is now up to 120 people. A feeling of inclusion for the folks who join the street team; and the ability for authors to put faces/names/relationships on their readership. For readers, there is the joy of shared enthusiasm. I’m a big fan of the nerdfighter community that John and Hank Green have created, which is all about enthusiasm for things that matter most to them. This goes from the most silly things, to the deepest: raising money for charity. Shared journey – allows an author to have buddies in this process of publishing; it allows readers to feel a part of something, even if they aren’t writing and publishing books. Especially for already popular authors, street teams seem to be a great way to stay connected with passionate fans in a manageable way, on a daily basis. It allows an author to easily consider how they can scale their audience engagement efforts. For instance, they can have community managers who engage daily with the street team members, and the author can pop in when they aren’t writing. It isn’t so much a hierarchy as a way to create sustainability around engaging with readers. My gut is that being a part of a street team is a badge of pride for many readers, it becomes an identity for them. This can align to a narrative that they appreciate – that perhaps they haven’t written the novels the author has – but they can still be a part of that process. I love how vulnerability and enthusiasm seem to be core parts of this, two terms I have been thinking a lot about recently. It’s too easy to be seen as, “I’ll give you bonuses and attention if you will promote promote promote me me me!! !” Connecting on a human level has to be the core of this, and that is a serious responsibility for the folks organizing a street team. The flipside of organizing shared enthusiasm in this way: fans feeling as though the value isn’t equal. The author opens themselves up to judgement by sharing more of their process and of asking fans to do work for them. Ideally, trust is developed slowly, but too much enthusiasm for promotion too quickly could lead to crossing signals and miscommunication. Social stuff is complex: readers could feel too much pressure; cliques could form within a street team, and one could feel like a wallflower in especially popular street teams. It is INCREDIBLY DIFFICULT to properly manage a small community like this consistently over time. For instance, many authors will have loads of motivation to support the community around a book launch, but will they feel equal responsibility in the months/years between books? As more people develop their own street team, it will become a de facto tactic, where you are constantly being asked to be on street teams as a marketing tactic. I remember when Michael Hyatt created a Launch Team for his book. He reported that 764 people applies to be on this team, and he selected 100. It’s fascinating for me to consider the value of a team like this from the viewpoint of both a wildly popular author, and from the standpoint of an author prepping the publication of their first book. Clearly, there is value in both cases. Shelli indicated that running her street team is indeed time consuming, and that in the beginning, there is no clear payoff. She hasn’t gone with them through a book launch yet, that will happen a bit later in the year. But my gut is, it’s better to go through a book launch with 120 people who love your work, than with just you and your cat. It’s always more fun with a buddy. Authors find that many people who sign up are not as passionate as you hope they will be. Managing expectations on both sides is important. When using giveaways to get folks to join a street team, you may find that only a small portion remain an active fan base – those who will complete a “mission.” The rest were just interested in the initial chance to win something, and were not really interested in a larger investment of their time and energy. Have clear guidelines governing expectations and behavior. You will hear stories of some street team members being a little too enthusiastic. Just like the metaphor the term comes from, you likely don’t want your fans “getting in people’s faces” on the street, but merely amplifying something they are excited about. Within reason. Kate said, “you don’t join a street team to get free stuff, you do it because you love the author.” It’s not a bribery system. There can be a fine balance. 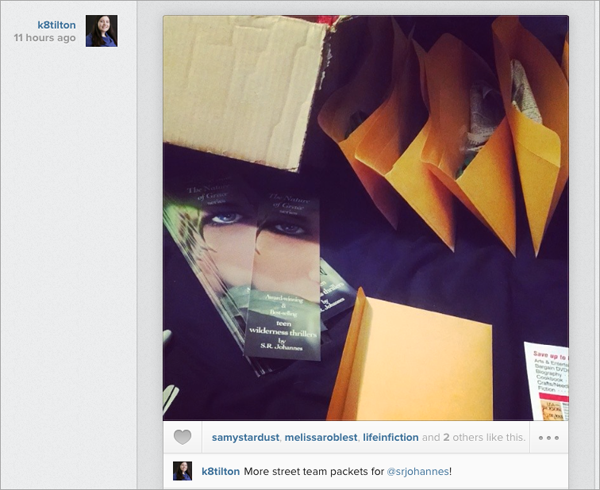 More from Kate on street teams here and here. Are street teams right for you? That is for you to decide. But I do love how they focus very much on relationships and interactions with readers, and how they seem to have a mix of vulnerability and enthusiasm, that it requires a human investment to build a meaningful community.